Let’s take stock of the outlandish claims from the Trump administration that have piled up over the past week, as a caravan of more than 5,000 migrants from Central America began its journey to the U.S.-Mexico border. Thousands of people from El Salvador, Guatemala and Honduras have sought refuge in the United States during both the Obama and Trump administrations, fleeing gang violence and poverty in their home countries. This exodus has been going on since 2014. Journalists on the ground say many migrants caught wind of this latest caravan via messaging apps, viral posts on social media and TV news reports before deciding to join. In Honduras, where the group originated, the poverty rate was 60.9 percent in 2016, according to the World Bank. The country had one of the highest murder rates in the world in 2017, 43.6 per 100,000 inhabitants, according to the Observatory of Violence at the National Autonomous University of Honduras. No matter. President Trump and his administration — not exactly known for their record of truth-telling on immigration — have set the spin machine to full blast. The caravan might have been orchestrated by Democrats or Venezuela, they say. It includes criminals, or MS-13 gang members, or possible terrorists, or people of (gasp!) Middle Eastern descent, they add. So here we are again, fact-checking a bunch of phony claims about immigration. Trump had been grousing about the caravan for days, but a segment on “Fox & Friends” seems to have stuck with him. On Oct. 22, the caravan was featured around breakfast time. Half an hour later, as the New York Times noted, Trump began fuming on Twitter. We’re going to round up some of the claims that he and other administration officials have made about the caravan. The Trump administration has provided no evidence that criminals, members of the MS-13 gang or people of Middle Eastern descent form part of the caravan. Trump has been criticized for profiling people of Middle Eastern descent with these remarks. It’s also unclear whether the military could be deployed to stop border crossings. Presidents George W. Bush and Barack Obama sent the National Guard to the U.S.-Mexico border to provide technical or administrative help, the nonpartisan Congressional Research Service found, but deploying members of the Armed Forces might not be so easy. “The use of the military to enforce immigration or criminal laws at the border could run afoul of the Posse Comitatus Act, unless an exception applies,” according to a CRS report from April 2018. Sanders implied that 10 suspected or known terrorists are apprehended at the U.S.-Mexico border every day. Pence took things further the next day, stating as fact that 10 suspected or known terrorists from the Middle East are apprehended daily. As our colleague Aaron Blake of The Fix found, this is a spurious statistic. Homeland Security Secretary Kirstjen Nielsen said in June that “on average, my department now blocks 10 known or suspected terrorists a day from traveling to or attempting to enter the United States.” That covers all ports of entry: airports, maritime ports, and the land borders with Canada and Mexico. Almost all suspected or known terrorists are apprehended at airports. The Department of Homeland Security on Oct. 22 told reporters that in fiscal 2018, Customs and Border Patrol agents “apprehended 17,256 criminals, 1,019 gang members, and 3,028 special interest aliens from countries such as Bangladesh, Pakistan, Nigeria, and Somalia.” None of those countries is in the Middle East. These figures do not cover the migrants in the current caravan or whether any of them are suspected or known terrorists. Notice how Pompeo is in sync with Trump in describing the caravan as a risk but doesn’t go so far as to say whether any members of the caravan are terrorists, criminals or people of Middle Eastern descent. This is an artful sequence of tweets. Although Houlton said DHS “can confirm” that some people in the caravan “are gang members or have significant criminal histories,” once again, we ran into the brick wall of no evidence. “We cannot discuss or share data or information that is law enforcement sensitive,” a DHS official said. The next tweet says people from all over the world are traveling through Mexico toward the United States. That’s accurate because Mexico has international flights that go north and travelers at the border. Nothing in this second tweet says people from “the Middle East, Africa, South Asia, and elsewhere” are in the caravan. The third tweet urges people to “come to America” in “the right and legal way.” U.S. law says “any alien who is physically present in the United States . . . whether or not at a designated port of arrival” may apply for asylum. Although the caravan’s origin story remains somewhat opaque, the answer from many migrants here is that they had wanted to leave for months or years, and then — in a Facebook post, on a television program, in a WhatsApp group — they saw an image of the growing group and decided. “Right away, I knew I would go,” said Irma Rosales, 37, from Santa Ana, El Salvador, who saw images of the caravan on television and bought a bus ticket to meet up with the group in Guatemala last week. “I had been waiting for a way to get north, and then I heard about the caravan,” said Ediberto Fuentes, 30, who had fled Honduras for southern Mexico but was stranded for months, without the money to pay for a smuggler to travel to the United States. On Tuesday, they stopped to rest in the small southern Mexican city of Huixtla, washing their clothes in buckets of water, sending messages to their families from Internet cafes, accepting whatever donations local residents were willing to offer. There was word that hundreds more migrants from across Central America, drawn by the endless media coverage, were on their way. The Honduran president has been blaming the political opposition for ginning up the caravan as an effort to embarrass his government, but in the passage quoted above, The Post interviewed several people who were self-motivated to join the caravan. Pence said the Honduran president told him Venezuela was funding the groups. 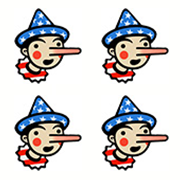 The Post reported, “There is no evidence to support that claim.” We couldn’t find evidence for this fact check that Cuba is funding the caravan. A video Trump posted on Twitter shows two men handing out cash to members of the caravan during a stop in Guatemala. But the video does not indicate who the men are or where they got the money. Zero evidence shows Democrats are funding the caravan. The three Central American countries in question have pledged $8.6 billion from 2016 to 2018 to address “the security, governance, and economic drivers of illegal migration and illicit trafficking,” a State Department official added. The Trump administration wants to tighten U.S. asylum laws, and the president blames Democrats for not going along. Trump needs 60 votes in the Senate, meaning he needs all Republicans and at least nine Democrats, to clear the way for a filibuster-proof immigration bill. But that’s assuming he gets all 51 Republicans on board, which the White House could not gather the last time it wanted to close what Trump describes as loopholes in the asylum laws. The Secure and Succeed Act, sponsored by Sen. Charles E. Grassley (R-Iowa), failed 39 to 60 in the Senate in February. The White House backed this proposal, which got 36 of 51 GOP votes and three Democratic votes, far short of passage. Three other immigration proposals, backed by broader mixes of Republicans and Democrats, each got more than 50 votes. The White House did not respond to our questions. “There’s no proof of anything. But there could very well be,” Trump said in the Oval Office on Oct. 23. This is a bunch of misinformation, packed into just a few short days. Trump and his top advisers continue to show a serious credibility problem on immigration, as demonstrated by this barrage of false, misleading, unsubstantiated or implausible claims about the caravan. They earn Four Pinocchios.